Description: Passing under the signal bridge at King Plow heading for Inman Yard. Description: Returning to Atlanta after a stint in work train service hauling pre-manufactured switch handling cars. Description: The pair (57, 52) are headed for Camden, NJ. Description: Enroute to Camden, NJ. 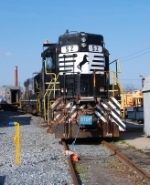 Description: A variety of power at the Conrail Shared Assets Pavonia yard. Description: A closer look at the high short hood of this old relic. Description: Looking head on at this SD9m. Description: A pair of SD9m's at the Pavonia engine house. Description: The two remote control equipped SD9m's stored at the Pavonia Yard engine house still rusting to the rails. Description: The engine line up at the Conrail Shared Assets Pavonia Yard enginehouse. Description: Three Norfolk Southern units, an ex-Amtrak baggage car, and a CSX GP40-2 sitting at the Pavonia Yard enginehouse. 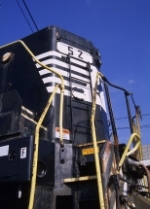 Description: A high hood GP38-2 sits on the Pavonia Yard engine house tracks with an ex-Amtrak baggage car and two Norfolk Southern high hood SD9Ms. Description: ND SD9m units 52 and 57 at Pavonia Yard.